I finally did it. I purchased Scrivener. Now I have to hold onto my self-worth as I try to wrap my brain around the interface. I keep telling myself, so many experts can't be wrong, right? Surely, when I've mastered this program, I'll come out on top. On top meaning I will have a tool that will give me more functionality, save me more time, and overall, make me a more organized and efficient writer. Currently, I'm doing pretty good with a combination of MS Word and Excel, so this baby better be awesome to convince me to convert for long term. So basically, I've purchased the Scrivener software that experts are saying is functionally amazing, but its user interface is so non-intuitive, I can't figure it out, and I used be an Internet Business Consultant. Surely my skills aren't that rusty. 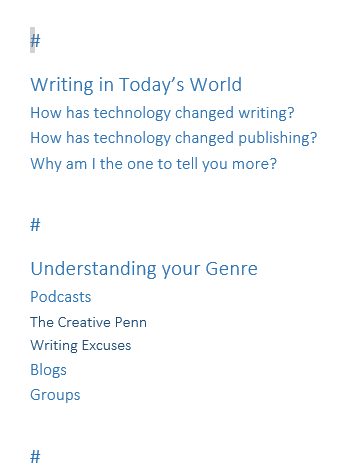 A few searches and I discover most of the experts claiming Scrivener works great, have paid for this course LearnScrivenerFast, which seems to consist of concise engaging lessons. Problem solved right? Wrong! 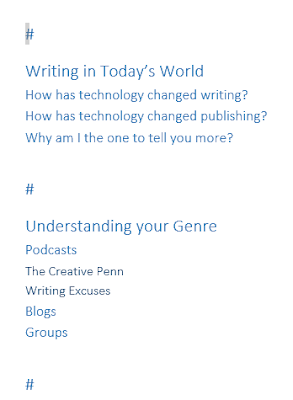 I paid $50 for Scrivener, and this awesome course is another $300. So, basically, I just purchased a license to a software product that people have had to create courses on, so users can figure out how to use it. That doesn't sit right with me. Second reason not to part with my Canadian loonies has something to do with the Yukon Gold Rush. In the late 1890s, about 100,000 hopeful prospectors hiked into the Canadian Yukon hoping to find gold. Now I ask, was it more fruitful to be a miner during the gold rush or did selling pickaxes to all the men with gold fever turn a better profit? You got it. Owning the mercantile was the way to make the most money and to come out a winner. So, I'm trying to limit my spending. Each dollar I spend learning how to be a better writer is going to come out of my profits when I am a better writer. Basically, I'm climbing the Yukon trail without the pickaxe! So, after an entire four hours spent struggling with the Scrivener interface (1990's interface I might add), I wouldn't personally suggest purchasing it. But if you did, like me, here is what I feel are the very first steps to take. Generally, step 1 should refer you to the 340 page PDF document Scrivener offers, however, I think the beginning of this sentence already explains why you shouldn't start there, if you're in a hurry. The Book Ninja offers non-fiction templates for $10, and many sites offer free templates. Too many. So this might take some time. Search for the keywords "Free Scrivener Novel Outline Fiction OR Non-Fiction". Then start weeding through the results. I found Caroline Norrington's Fiction outline to be quite detailed. Once you have downloaded the zip file, you will need to follow these instructions. Your computer should unzip the file if you click the folder. Save the files in a computer folder you name "Scrivener templates"
Open your Scrivener program and select "file" and then "open"
Opening the inspector in Scrivener was like putting an addition on the house. Click the "view" tab in the top row of navigation in Scrivener. Select "layout" from the drop down menu. Click the box beside "inspector" to open it in the right of your screen. A shortcut option is to click the little blue circle in the top right of the Scrivener screen. Interface Rant: There are too many ways to accomplish actions in this software. 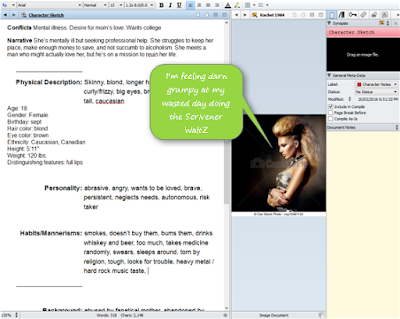 Notes (notes attached to binder items (chapters) or general notes attached to the entire manuscript, or images you drag and drop there). Meta-data (label and status, modified and created date). Move your mouse around Scrivener before you get your manuscript in there, and just start clicking and following the dropdown boxes and see what it does. Yes, you'll find a multitude of buttons that add items to your binder. The good news is, you'll learn to highlight and drag those items to your trash bin. I did this many times. Now that you've established you haven't learned anything, but you have reduced your fear of clicking buttons, you are now ready to import your manuscript. Hells Bells! It took me about two more hours to find a semi-acceptable way to import my established MS Word manuscript into Scrivener using the "import and split" feature. What I was hoping for is that Scrivener would recognize Heading 1 and Heading 2 and Heading 3 commands of my MS Word doc and then separate accordingly into chapter folders in the binder. No such luck, so far. If anyone knows of another way to accomplish this, please let me know. Type a key symbol of your choice into your manuscript to indicate where Scrivener should split your text into sections upon import. I used this key # - see image to the right. In Scrivener, click "file" and then select "import" and then select "import and split" (see visual example below). A pop-up will ask for more details. Select your MS file, then type in the key you used to identify the splits (#). Once you've imported, you will see the splits in the binder section of Scrivener. 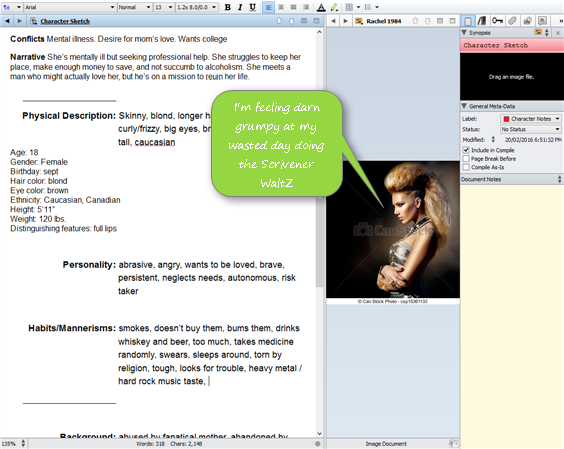 In my example above, I have chapters and sub-titles. My next step is to place my curser in front of each sub-title in Scrivener and click CNTRL + K This will split off another section for me. You can't see me clicking the button combination, but you will see me placing my cursor in front of "How has technology changed Writing" etc. Last step is to convert the binder items into chapter folders or sections. If you did this step differently, how did you do it? Is there an easier way? I'd love to hear it. With your help, maybe you'll save me from wasting another day I'll never get back on the Scrivener Waltz.